IOC President Jacques Rogge (at the podium) delivers a congratulatory speech during the opening ceremony of the 2006 SportAccord at the COEX Convention Center in Seoul on April 3, 2006. SportAccord 2006, a premier international sports convention, kicked off on April 3, 2006 for a five-day run at the Grand InterContinental Hotel in Seoul, Korea, bringing together over 900 influential sports figures from about 60 countries. The annual event, the fourth of its kind and the first in Asia, has established itself as one of the largest and most important gatherings of international sports leaders and decision-makers in the world. Among the participants are sports administrators from about 100 international sports federations affiliated to the General Association of International Sports Federations (GAISF), the Association of Summer Olympic International Federations (ASOIF) and the Association of the International Olympic Winter Sports Federations (AIOWF), as well as the International Olympic Committee (IOC) Executive Board. Owned by GAISF, ASOIF and AIOWF, SportAccord encompasses the annual associations' congress and general assemblies, as well as open conference sessions, workshops, seminars, an exhibition and numerous networking opportunities. GAISF, founded in 1967, is the umbrella organization of 100 international Olympic and non-Olympic sports federations and organizations. "SportAccord is a unique opportunity for you, leaders in the fields of sport and business, to convene together. From Madrid to Lausanne to Berlin, SportAccord has provided us with the ideal platform to conduct and exchange ideas in the most favorable conditions," said Dr. Chungwon Choue, chairman of the Seoul Organizing Committee for SportAccord 2006. Dr. Choue, who also serves as president of the World Taekwondo Federation, added, "The hosting of SportAccord 2006 and the ANOC General Assembly in Seoul will be beneficial to the international standing of our city, and at the same time Seoul will serve as a gateway to Asia for our global partners." 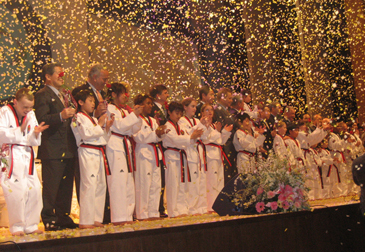 Members of a taekwondo demonstration team pose with IOC President Jacques Rogge and other leading sports leaders during the opening ceremony of SportAccord 2006 at the COEX Convention Center in Seoul on April 3, 2006. The General Assembly of the Association of National Olympic Committees (ANOC) started on March 31 at the COEX Grand Ballroom in Seoul. Dr. Choue made the remarks in his opening speech during the opening ceremony of SportAccord 2006, which was held at the COEX Convention Center in Seoul. The Seoul-based WTF, the world governing body for taekwondo, took the initiative to win the right to host SportAccord 2006 at SportAccord 2005 in Berlin, Germany. A host city contract for SportAccord 2006 was inked on July 18, 2005 in Seoul. At the opening ceremony of the 2006 SportAccord, IOC President Dr. Jacques Rogge, SportAccord Chairman Mr. Hein Verbruggen, Korean Minister of Culture and Tourism Myung-gon Kim and Korean Olympic Committee President Jung-kil Kim delivered their respective congratulatory speeches. In his congratulatory remarks, Minister Kim said, "The dynamic mixture of seminars, workshops and exhibitions made SportAccord a premiere event for the sporting movement." "By successfully hosting events such as the 1988 Seoul Olympic Games and the 2002 World Cup, Korea has been able to establish the necessary infrastructure for hosting such large-scale international competitions," Kim said. "Korea has also accumulated the knowledge-base and skill-set to hold even better competitions in the future." Minister Kim added, "Not only did those events lay the foundation for economic growth in the 21st century, but they also signaled the end of the Cold War Era and ushered in a new and vibrant civil society in Korea." "That is why I hope that we will all have the opportunity this year at the 2006 SportAccord convention to transfer know-how for successful events and to rediscover the true legacy of international sporting competitions and conventions." 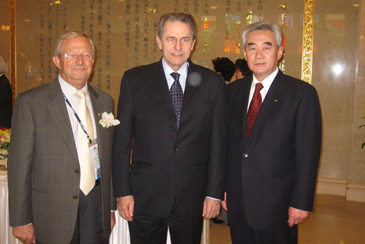 IOC President Jacques Rogge (center) poses with Australian IOC member Phillip W. Coles (left) , and Dr. Chungwon Choue, chairman of the Seoul Organizing Committee for SportAccord 2006 and president of the World Taekwondo Federation, during a reception to mark the conferment of an honorary doctorate degree in physical education on Dr. Rogge at Kyung Hee University in Seoul on April 2. Touching on the 2006 SportAccord, IOC President Rogge said, "Conventions such as SportAccord can all share our experience, learn from each other and discuss common issues which challenge us." "This year, in the Korean Olympic city, hundreds of delegates from sports organizations and the sports industry will reflect on experiences learnt in the staging of a successful multi-sports event and in financing and promoting sport," Dr. Rogge said. "The IOC is proud to be leading the way in transfer of knowledge programs, with lessons from yet another Games now being passed on to future organizers. These programs have been vital to our efforts to manage complexity, cost and risk." In a ceremony on April 2, Dr. Rogge received an honorary doctorate degree in physical education from Kyung Hee Univerisity in Seoul. Mr. Verbruggen, chairman of SportAccord and acting president of GAISF, said of the SportAccord 2006, "We are delighted to be collaborating with the Ministry of Culture and Tourism of the Republic of Korea and the World Taekwondo Federation, which have played a key role in bringing SportAccord to Korea, and which have enabled us to organize the event you are now attending." He added that the concept of bringing members of sports federations, sports events, host cities and sports businesses together for an annual gathering "has proved to be hugely beneficial to each of these related but diverse communities." "SportAccord has fostered an unprecedented level of communication and idea-sharing between individuals as well as organizations, and we have all been able to learn from one another." "All of us are most grateful for the cooperation we have received from the IOC and the endorsement they have given this event by their presence since the very first SportAccord in 2003," Mr. Verbruggen said. "The faith they have shown in the idea of bringing the world's sporting interests together once a year has enabled SportAccord to grow and prosper." KOC President Kim said, "The concurrent hosting of two major sporting events like the ANOC General Assembly and the SportAccord is testament of our international standing." "The 2006 SportAccord, by addressing the numerous issues at hand, will contribute greatly to the further development of sports around the world." The fourth annual SportAccord convention offers the commercial sector a once-a-year opportunity to network face to face with all of the international sports federations, plus Olympic associations, bidding and host cities, lawyers, broadcasters and suppliers. The 2006 SportAccord features an exhibition of 66 cities, federations and commercial organizations and an outstanding line-up of over 60 speakers, including past and future Olympic host cities, international sports federations and leading media and marketing organizations. Among the major exhibitors this year are UK Trade & Investment, which is also a silver sponsor of the conference, Comunidad Valenciana and the XV Pan American Games Rio 2007, plus five Korean exhibitors – the Seoul Olympic Sports Promotion Foundation, Chuncheon, Daegu, the Korea Tourism Organization, and the Korea Ssireum Organization. The exhibition starts April 5, 2006 for a three-day run. SportAccord has also secured 16 sponsors for the 2006 event, including two gold sponsors: IEC in Sports and The Contemporary Group. IEC in Sports, whose headquarters are based in Stockholm, is a gold sponsor for the event for the third consecutive year. There are seven silver sponsors for the 2006 SportAccord, such as the city of Chuncheon, pmpLEGACY and Sydney Olympic Park. There are another seven bronze sponsors like FIBA and Glasgow2014. 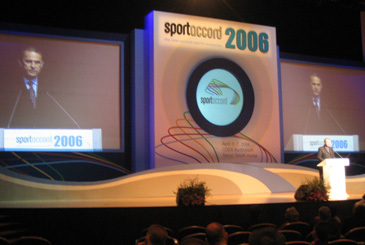 One of the highlights of the 2006 SportAccord convention is the conference, which will start tomorrow for a two-day run. The conference will feature two break-out streams, "Staging a Successful Major Event" and "Financing and Promoting a Sport." "The subjects of the conference are aimed to appeal to both sports federations, event-hosting cities and their commercial partners. There will also be cross-topic interviews of the day," said Ms. Anna Hellman, general manger of SportAccord. Speakers at the conference include IOC President Dr. Rogge; John Furlong, chief executive of Vancouver 2010; Carlos Arthur Nuzman, president of the Organizing Committee of the XV Pan American Games Rio 2007; Vivian Lines, president and chief operating officer Asia Pacific of Hill & Knowlton; and Debbie Jevans, director of sport at London 2012. Among other speakers are Sir Philip Craven MBE, president of the International Paralympic Committee; Tom Dielen, secretary general of the International Archery Federation; and Yang Shu'an, vice president of the Beijing Organizing Committee of the 2008 Beijing Olympic Games.